Bill Withers onstage in 1973. Bill Withers' very first single became a breakout hit in 1971. He would go on to record nine albums over the next 14 years, and all of them are now available on a new box set, The Complete Sussex and Columbia Masters. It may sound contradictory to describe Bill Withers' voice as "uniquely plainspoken," but this singer and songwriter from West Virginia coal country began his career at the crossroads between folk, R&B and rock. He was neither a showy shouter nor a sweet crooner. Instead, Withers always conveyed his emotions with a simple, forthright earnestness — the everyman singer with a poet's soul. Withers experienced remarkable success right out of the gate, generating five hit singles from just the first two albums. It helped that he worked with Booker T and the MG's, and later the Watts 103rd St. Rhythm Band. Together they paired a heavy, low-end groove with acoustic guitar hooks, to create a sparse but soulful complement to Withers' blue-collar appeal. Withers' momentum slowed with his third album, the highly underrated Live at Carnegie Hall, from 1973. Most concert LPs are usually just greatest-hits compendiums, but almost half of the songs on Withers' live album were new and only appear on the LP. Few are better than "I Can't Write Left Handed," his ode to a returning Vietnam War vet. It opens with a hymn-like monologue that somehow makes the famed concert hall sound as intimate as a storefront church. The Complete Sussex and Columbia Masters also traces Withers' uneven journey into midcareer. His once signature songwriting began to sound more generic, and while the warm, reassuring voice was always there, his vocals could, at times, become buried under a squishy pile of fusion funk grooves. Withers was well suited to make the transition into soft rock that came to dominate FM radio by the early '80s, but his output also began to slow. Much to everyone's surprise, Withers opted to retire entirely in 1985, but not without leaving behind one last album. By then, he was in full adult-contemporary mode, but however milquetoast the music, it was still, unmistakably, Withers: that same familiar, comfortable voice conveying sincerity from a man who could make middlebrow sound better than anyone. In 1971, Bill Withers scored a breakout hit with his very first single. BILL WITHERS: (Singing) Ain't no sunshine when she's gone. It's not warm when she's away. CORNISH: Withers would go on to record nine albums over the next 14 years and then retire from music. Now, all of his recordings are available in one new boxed set. Reviewer Oliver Wang has this look at the singer's career. 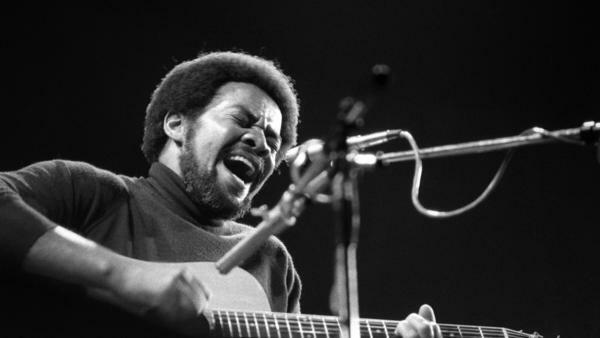 OLIVER WANG, BYLINE: It may sound contradictory to describe Bill Withers' voice as uniquely plainspoken, but this singer and songwriter from West Virginia coal country began his career at the crossroads between folk, R&B and rock. He was neither a showy shouter nor a sweet crooner. Instead, Withers always conveyed his emotions with a simple, forthright earnestness, the everyman singer with a poet's soul. WITHERS: (Singing) Grandma's hands clapped in church on Sunday morning. Grandma's hands played a tambourine so well. Grandma's hands used to issue out a warning. She'd say, Billy, don't you run so fast, might fall on a piece of glass, might be snakes there in that grass. Grandma's hands. WANG: Withers experienced remarkable success right out of the gate, generating five hit singles from just the first two albums. It helped that he worked with Booker T and the MG's, and later the Watts 103rd St. Rhythm Band. Together they paired a heavy, low-end groove with acoustic guitar hooks, to create a sparse but soulful complement to Withers' blue-collar appeal. WITHERS: (Singing) I want to spread the news that if it feels this good getting used. Oh, you just keep on using me until you use me up. WANG: Withers' momentum slowed with his third album, the highly underrated, "Live at Carnegie Hall" from 1973. Most concert LPs are just greatest hits compendiums, but almost half of the songs on Withers' live album were new and only appear on the LP. Few are better than "I Can't Write Left Handed," his ode to a returning Vietnam War vet. WITHERS: And I asked him how he was doing. He said he was doing all right now, but he had thought he was gonna die. WANG: It opens with a hymn-like monologue that somehow makes the famed concert hall sound as intimate as a storefront church. WITHERS: He said getting shot at didn't bother him. It was getting shot that shook him up. WANG: "The Complete Sussex and Columbia Masters" collection also traces Withers' uneven journey into midcareer. His once signature songwriting began to sound more generic. And while the warm, reassuring voice was always there, his vocals could, at times, become buried under a squishy pile of fusion funk grooves. WANG: Withers was well-suited to make the transition into soft rock that came to dominate FM radio by the early '80s, but his output also began to slow. Much to everyone's surprise, Withers opted to retire entirely in 1985, but not without leaving behind one last album. By then, he was in full adult contemporary mode, but however milquetoast the music, it was still, unmistakably, Withers, that same familiar, comfortable voice conveying sincerity from a man who could make middlebrow sound better than anyone. WITHERS: (Singing) You just can't smile it away. CORNISH: The new Bill Withers boxed set is called "The Complete Sussex and Columbia Masters." Our reviewer was Oliver Wang, an associate professor of sociology at California State University, Long Beach and author of the blog SoulSides.com. WITHERS: (Singing) They say love moves mountains.